The fourth Marian dogma is that concerning the Assumption of the Blessed Virgin Mary into heaven. Now in the East they speak not of her assumption but of her “dormition” or “falling asleep”. It has not been defined and it is still open to some discussion whether or not our Lady actually died before being assumed into heaven. It would seem that because she was conceived without original sin that she would not be subject to its punishments. This is indeed why we believe our Lady did not have birth pains, because that too was specifically one of the punishments for the original sin. Though, some believe that our Lady so wished to imitate her son to the greatest degree that she wished to die before leaving earth because He had done the same. Now having the definition I will give three sources that will most suitably flesh out this dogma. The first is from the must have handbook of theology that every Catholic ought to have in their library: Fundamentals of Catholic Dogma, by Dr. Ludwig Ott. Following will be discourses from the Rev. Father Reginald Garrigou-Lagrange O.P., and the great Saint Alphonsus Maria de Ligouri, Bishop and Doctor of the Church. a) Freedom from Sin. As the dissolution of the body is a punishment consequent on sin, and as Mary, the immaculately conceived and sinless one, was exempt from the general curse of sin, it was fitting that her body should be excepted from the general law of dissolution and immediately assumed into the glory of Heaven, in accordance with Gods’ original plan for mankind. b) Motherhood of God. As the body of Christ originated from the body of Mary (caro Jesu caro est Mariae: Ps.-Augustine) it was fitting that Mary’s body, should share the lot of the body of Christ. As a physico-spiritual relationship the Motherhood of Mary demands a likeness to her Divine Son in body and soul. c) Perpetual virginity. As Mary’s body was preserved unimpaired in virginal integrity, it was fitting that it should not be subject to destruction after death. d) Participation in the work of Christ. As Mary, in her capacity of Mother of the Redeemer, took a most intimate share in the redemptive work of her Son it was fitting that, on the completion of her earthly life, she should attain to the full fruit of the Redemption, which consists in the glorification of soul and body. The idea of the bodily assumption of Mary is first expressed in certain transitus-narratives of the fifth and sixth centuries. Even those these are apocryphal they bear witness to the faith of the generation in which they were written despite their legendary clothing. The first Church author to speak of the bodily ascension of Mary, in association with an apocryphal transitus B.M.V., is Saint Gregory of Tours (594). Early sermons on the Feast of Mary’s entry into heaven are those of Ps.-Modestus of Jeruselem (about 700), Germanus of Constantinople (733), Andrew of Crete (74), Saint John Damascene (749) and Theodore of Studion (826). In the East, at least since the sixth century, and at Rome, at any rate, since the end of the seventh century (Sergius I, 687-701) the Church celebrated the Feast of the Sleeping of Mary (Dormitio). The object of the Feast was originally the death of Mary, but very soon the thought appeared of the incorruptibility of her body and its assumption into Heaven. The original title Dormitio (Sleeping) was changed to assumptio (Sacramentarium Gregorianum). In the Liturgical and Patristic texts of the eighth and ninth centuries, the idea of the bodily assumption is clearly attested. Under the influence of Ps-Hieronymus, there was uncertainty for a long time as to whether or not the assumption of the body was signified by the Feast. Since the peak of the period of the Middle Ages, the affirmative view has gained precedence, and has now been dominant for a long time. Now the following article is most interesting because it was written just a short time before the definition was actually made and we can see a very deep and incisive theological look at the question by one who very probably did some work in advising the Holy Father on whether or not he should make the definition. This process is worth seeing with its finished product considering the ongoing work on the proposed 5th Marian Dogma which Garrigou-Lagrange and many others wrote about as well. Revelation declares that the Mother of the Savior is the vanquisher of and is not vanquished by the devil, sin, and death. 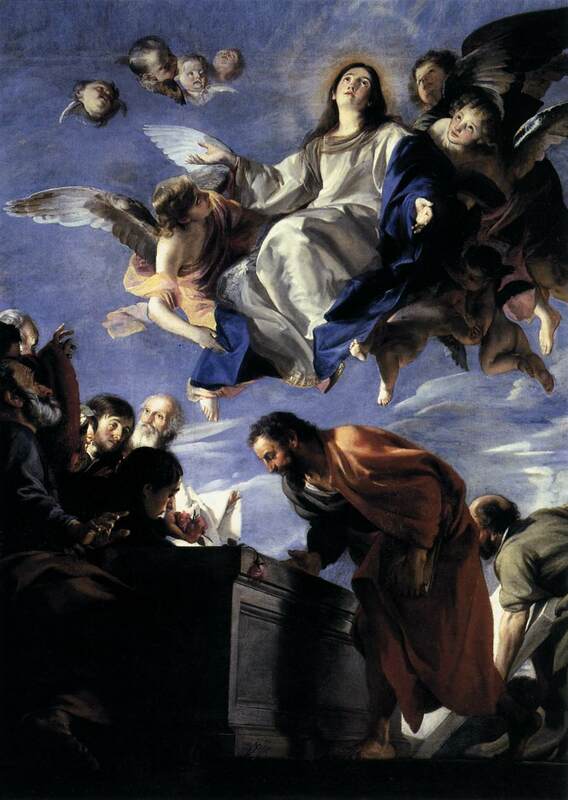 In recent times William Hentrich and Rudolf Gualtero de Moos published a work in two volumes, which contains the petitions addressed to the Holy See postulating the definition of the corporeal Assumption of the Blessed Virgin Mary into heaven. These petitions were proposed by various members of the hierarchy, starting with the highest and included the reasons of the more prominent dogmatic theologians, from various parts of the world, and were arranged in chronological order in manifestation of the consent of the Church. From the day when the Immaculate Conception of the Blessed Virgin Mary was proclaimed a dogma of our faith, many bishops throughout the Catholic world, very many priests, religious, and faithful postulated the definition of the Blessed Virgin Mary’s Assumption as constituting the crowning doctrine of the Church concerning the privileges that stem from her divine maternity. From the time of Leo XIII these petitions have been placed on file by a special department of the Supreme Congregation of the Holy Office, but up to the present time these had not been published. The Most Reverend Fathers W. Hentrich and R. G. de Moos, S. J., qualifiers of the Holy Office, with the greatest of care prepared for publication a work containing all these petitions. For this all lovers of this cause of Mary’s Assumption are most thankful, and especially theologians who study the questions about the definability of this privilege. As explained in the introduction to the first part of this work, contained in the first volume and in the second volume up to page 658, these petitions are arranged in hierarchical order, beginning with the cardinals, patriarchs, councils and synods, residential bishops, vicars capitular, coadjutors, bishops, auxiliary bishops, prefects apostolic, religious orders, universities, Catholic faculties, and congresses. Moreover, for each diocese, there is a collection of all the petitions sent in by each of the successive ordinaries. There is an analysis attached to each petition, so that its doctrinal import may be more clearly seen. In this documentary part, petitions are collected of 113 cardinals, 18 patriarchs, 2, 505 archbishops and bishops, 383 vicars capitular, and a great number of other prelates, rectors of Catholic faculties, and also 32, 000 petitions from the secular and regular clergy, 50, 000 from nuns and sisters, and more than 8, 000, 000 petitions from the faithful. In the second part, the possibility and opportunity of solemnly defining the dogma of the Assumption is methodically and clearly set forth. There is a special inquiry about what the teaching Church dispersed throughout the world, represented by more than 3,000 petitions of bishops, apostolic vicars, and others, teaches concerning this question, namely, whether the truth of Mary’s Assumption is contained in the deposit of revelation. With this end in view, the dogmatic, geographical, and historical nature of the aforesaid documents was written. These petitions were arranged in thirty-five sections, according to the various formulas made use of by the authors of the petitions. As Hentrich and de Moos reported in their work: “Many argue from the fact that the faith of the whole Church in the Assumption cannot be explained without formal divine revelation.” In this same work the petitions are arranged according as they agree in their method of argumentation with this or that theological proof. From all these inquiries it appears that almost all the petitions of the ordinaries from the year 1869 to 1941 postulate the definition of the Assumption as a dogma of the faith. Moreover, it must be noted that the number of dioceses that were not vacant, whose bishops sent in these petitions, represent almost three fourths of all the dioceses in the Catholic Church. Then what results from this laborious compilation is that in the Eastern Church all the patriarchates, and three fourths of the dioceses with resident bishops in union with Rome, also postulate the dogmatic definition of the Assumption. The geographical location of all the dioceses from which these petitions came is set forth. Finally, the above-mentioned work records the history of this movement that postulates the dogmatic definition of the Blessed Virgin Mary’s Assumption into heaven. The publication of this great work was most gratefully received by all the bishops of the Catholic Church, by all Catholic universities and seminaries, and by all who discuss theologically the definability of this truth and who pray that this privilege of the Blessed Virgin Mary may be solemnly defined as a dogma. Some will say perhaps that it is not quite certain that these petitions of the bishops are postulating the definition of the Assumption as formally and implicitly revealed. Several perhaps think that it is only virtually revealed, and according to the majority of theologians, this is not enough so that any truth can be defined as a dogma of the faith formally to be believed on the authority of God revealing. There are two ways of answering this objection. It must be observed that the fact of the Assumption is certain from tradition, inasmuch as the solemn feast of the Assumption is universally celebrated in the Latin and Greek Churches, at least from the seventh century. For the institution of this solemn and universally celebrated feast is an expression of the general tradition of the Church, even of her ordinary and universal magisterial authority, and expresses the consent of the Church both teaching and taught, which is confirmed by these recent and most numerous petitions, which strictly postulate the dogmatic definition. All these facts presuppose that the fact of the Assumption is a certainty in the Church. But this fact of the Assumption cannot be certain without divine revelation, as regards the term whereunto of the Assumption, or as regards the entrance of the Blessed Virgin Mary body and soul into heaven. St. Thomas well explains this for our Lord’s ascension, whose term whereunto transcended any natural knowledge of the witnesses. We already gather from the preceding that the certainty the Church has about the fact of the Assumption presupposes formal and at least implicit revelation. The history of this question was never concerned with any private revelation of the Assumption, which might have resulted, apart from any discussion, in the institution of this solemnity in both the Western and Eastern Churches. Hence now, in our times, the bishops in almost all parts of the world speak, not as private theologians, but as witnesses and judges in the matters of faith, for whom the fact of the Assumption is certain because of the universal tradition, and it cannot be certain without formal and at least implicit revelation. Hence there is no need to inquire whether these bishops, as private theologians, maintain these two propositions, namely: for the definability of any truth it must be formally and implicitly revealed and not merely virtually, and that it is sufficiently proved theologically that the privilege of the Assumption is formally and implicitly revealed. This calls for a deep and complex study of the question, and it is no wonder that in this difficult question not all theologians are in agreement. 2) Moreover, these bishops are aware of the fact that the majority of theologians maintain that for any truth to be defined as a dogma of the faith, it must be at least formally and implicitly revealed, which seems to us to be absolutely true, and many of the aforesaid petitions clearly state this. For many of these petitions point out that it was gradually and formally revealed that the Mother of the Savior is the vanquisher of the devil, sin, and death. For example, 144 of the petitioners argue from the special victory gained by Mary over the devil and sin or from the absolute opposition prevailing between the Virgin and the devil and his kingdom. But this reason frequently proclaimed by the Fathers was invoked by Pius IX in the definition of the Immaculate Conception; it was proposed by 200 fathers of the Vatican Council, to show that the Assumption of the Blessed Virgin Mary is formally and implicitly revealed, that is, not only as the effect is contained in the cause but as the part is in the whole; whereas the cause can be without its actual effect that is virtually contained in it, the whole cannot be without its parts. This reason that associates the Blessed Virgin Mary with Christ’s perfect victory over the devil and sin is a more proximate reason for the Assumption than the divine maternity, the fullness of grace and her divine blessedness among all women, all of which are likewise referred to by many of the petitioners. Hence it is no wonder that 144 of the petitions invoke this first reason, as well as 200 fathers of the Vatican Council. There are two revealed premises, however, in this argument, which would be already sufficient for its definability, and moreover it is not a strictly illative argument of a new truth, but an explanatory argument wherein the conclusion is contained in the premises, not only virtually as the effect is contained in the cause, but also formally and implicitly, as the part is contained in the whole; whereas the cause can be without the effect afterward to be produced, on the contrary, the whole cannot be without its actual parts. This theological reason may be expressed by the following syllogism. Christ gained a perfect victory over the devil, which contains as parts a perfect victory over sin, and consequently a perfect victory over death, manifested by His glorious resurrection and ascension. This major is formally revealed even explicitly in the texts of St. Paul quoted by 200 fathers of the Vatican Council in their postulation. But the Blessed Virgin Mary, as Mother of the Savior, who in all tradition is called the second Eve, is most closely associated with Christ’s perfect victory over the devil and sin. As we said, the major and minor of this argument are revealed, and this already suffices for the definability of the conclusion. Moreover, it is not a strictly illative argument resulting in a new truth, but an explanatory argument, whereby the parts contained in Christ’s victory over the devil are shown, namely, victory over sin and consequently over death. But the whole cannot exist without its parts. Hence in this way its definability is certainly proved. Moreover, 171 petitions argue from the Immaculate Conception, showing in the same way that the Blessed Virgin Mary’s victory over sin infers victory over death according to this revelation. Likewise 196 petitioners argue almost the same way from the intimate union and consent prevailing between the Virgin and Christ, her Son. Therefore the conclusion of the aforesaid traditional argument is not only virtually revealed, but is also formally and implicitly revealed. The denial of the Assumption means the denial of the major or minor, both of which are revealed; doubt about the Assumption means doubt about the major or minor. Therefore it was progressively and formally revealed that the Mother of the Savior, the new Eve, is the vanquisher of, and is not vanquished by, the devil, sin, and death. Hence these very many petitions show the definability of this privilege of the Blessed Virgin Mary and with equal clarity they manifest the opportuneness of its dogmatic definition, as the crowning doctrine of the Church concerning the divers privileges that stem from the divine maternity. Thus also the existence of eternal life would again be solemnly affirmed, of which the present life, unless it be to no purpose, must be ordered as merit to reward, and as the precious commencement for the ultimate end. It would seem right that on this day of the Assumption of Mary to Heaven, the holy Church should rather invite us to mourn than to rejoice, since our sweet Mother has quitted this world and left us deprived of her sweet presence, as Saint Bernard says: “It seems that we should rather weep than rejoice”. But no, the holy Church invites us to rejoice: “Let us all rejoice in the Lord, celebrating a festival in honor of the Blessed Virgin Mary”. And justly, for, if we love our Mother, we ought to congratulate ourselves more upon her glory than on our own private consolation. What son does not rejoice, though on account of it he has to be separated from his mother, if he knows that she is going to take possession of a kingdom? Mary, on this day, is crowned Queen of Heaven; and shall we not keep it a festival and rejoice if we truly love her? “Let us rejoice then, let us all rejoice”. And that we may rejoice, and be consoled the more by her exaltation, let us consider, first, how glorious was the triumph of Mary when she ascended to Heaven; and secondly, how glorious was the throne to which she was there exalted. After Jesus Christ, Our Savior had completed, by His death, the work of redemption, the angels ardently desired to possess Him in their heavenly country; hence they were continually supplicating Him in the words of David: “Arise, O Lord, into Thy resting place: Thou and the ark, which Thou hast sanctified” – Psalm 131:8. Come O Lord, come quickly, now that Thou hast redeemed men; come to Thy kingdom and dwell with us, and bring with Thee the living ark of Thy Mother, who was the ark which Thou didst sanctify by dwelling in her womb. Precisely thus does Saint Bernardine make the angels say: “Let Thy most holy Mother Mary, sanctified by Thy conception, also ascend”. Our Lord was, therefore, at length pleased to satisfy the desire of these heavenly citizens by calling Mary to Paradise. But if it was His will that the ark of the old dispensation should be brought with great pomp into the city of David, “And David and all the house of Israel brought the ark of the covenant of the Lord with joyful shouting, and with sound of trumpet” – 2Kings 6:15; how much greater and more glorious pomp did He ordain that His Mother should enter Heaven! The Prophet Elias was carried to Heaven in a fiery chariot, which according to interpreters, was no other than a group of angels who bore him off from the Earth. “But, to conduct thee to Heaven, O Mother of God”, says the Abbot Rupert, “a fiery chariot was not enough; the whole court of Heaven, headed by its King thy Son, went forth to meet and accompany thee”. Saint Bernardine of Siena is of the same opinion. He says that, “Jesus”, to honor the triumph of His most sweet Mother, “went forth in His Glory to meet and accompany her”. Saint Anselm also says, “that it was precisely for this purpose that the Redeemer was pleased to ascend to Heaven before His Mother; that is, He did so not only to prepare a throne for her in that kingdom, but also that He might Himself accompany her with all the blessed spirits, and thus render her entry into Heaven more glorious and such as become one who was His Mother”. Hence Saint Peter Damian, contemplating the splendor of this Assumption of Mary into Heaven, says, “that we shall find it more glorious than the Ascension of Jesus Christ; for, to meet the Redeemer, angels only went forth; but when the Blessed Virgin was assumed to glory, she was met and accompanied by the Lord Himself of glory, and by the whole blessed company of saints and angels”. For this reason the Abbot Guarric supposes the Divine Word thus speaking: “To honor the Father, I descended from Heaven; to honor My Mother, I re-ascended there”; that thus I might be enabled to go forth to meet her, and Myself accompany her to Paradise. Let us now consider how Our Savior went forth from Heaven to meet His Mother. On first meeting her, He said: “Arise, make haste, My love, My dove, My beautiful one, and come. For winter is now past, the rain is over and gone” – Canticles 2:10,11. Come My own dear Mother, My pure and beautiful dove; leave that valley of tears, in which, for My love, thou hast suffered so much. “Come from Libanus, my spouse, come from Libanus, come; thou shalt be crowned”. Come in soul and body, to enjoy the recompense of thy holy life. If thy sufferings have been great on Earth, far greater is the glory which I have prepared for thee in Heaven. Enter then that kingdom, and take thy seat near Me; come to receive the crown which I will bestow upon thee as Queen of the Universe. Behold, Mary already leaves the Earth, at which she looks with affection and compassion; with affection, remembering the many graces she had there received from her Lord; and with affection and compassion, because in it she leaves so many poor children surrounded with miseries and dangers. But see, Jesus offers her His hand , and the blessed Mother already ascends; already she has passed beyond the clouds, beyond the spheres. Behold her already at the gates of Heaven. When monarchs make their solemn entry into their kingdoms, they do not pass through the gates of the capital, for they are removed to make way for them on this occasion. Hence, when Jesus Christ entered Paradise, the angels cried out: “Lift up your gates, O ye princes, and be ye lifted up, O eternal gates; and the King of Glory shall enter in” – Psalm 23:8. Behold, Mary already enters that blessed country. But on her entrance the celestial spirits, seeing her so beautiful and glorious, ask the angels without, as Origen supposes it, with united voices of exultation, “Who is this that cometh up from the desert, flowing with delights, leaning upon her Beloved?” – Canticles 8:5. And who can this creature so beautiful be, that comes from the desert of the Earth; a place of thorns and tribulations? But this one comes pure and rich in virtue, leaning on her beloved Lord, Who is graciously pleased Himself to accompany her with so great honor. Who is she? The angels accompanying her answer: “She is the Mother of our King; she is our Queen, and the blessed one among women; full of grace, the Saint of saints, the beloved of God, the immaculate one, the dove, the fairest of all creatures”. Then all the blessed spirits begin to bless her and praise her; singing with far more reason than the Hebrews did to Judith: “Thou art the glory of Jerusalem, thou art the joy of Israel, thou art the honor of our people” – Judith 15:10. Ah, our Lady and our Queen, thou then art the glory of Paradise, the joy of our country, thou art the honor of us all; be thou ever welcome, be thou ever blessed! Behold thy kingdom; behold us also, who are thy servants, ever ready to obey thy commands. All the Saints who were in Paradise then came to welcome her and salute her as their Queen. All the holy virgins came: “The daughters saw her, and declared her most blessed; . . . . and they praised her” – Canticles 6:8. “We”, they said, “O most blessed Lady, are also queens in this kingdom, but thou art our Queen; for thou wast the first to give us the great example of consecrating our virginity to God; we all bless and thank thee for it”. Then came the holy confessors to salute her as their Mistress; who, by her holy life, had taught them so many virtues. The holy martyrs also came to salute her as their Queen; for she, by her great constancy in the sorrows of her Son’s Passion, had taught them, and also by her merits had obtained them strength, to lay down their lives for the Faith. Saint James, the only one of the Apostles who was yet in Heaven, also came to thank her in the name of all the other Apostles for all the comfort and help she had afforded them while she was on Earth. The Prophets next came to salute her, and said: “Ah Lady, thou wast the one foreshadowed in our prophecies”. The holy Patriarchs then came, and said: “O Mary, it is thou who wast our hope; for thee it was that we sighed with much ardor and for so long a time”. But amongst these latter came our first parents, Adam and Eve, to thank her with still greater affection. “Ah, beloved Daughter”, they said, “thou hast repaired the injury which we inflicted on the human race; thou hast obtained for the world that blessing which we lost by our crime; by thee we are saved, and for it be ever blessed”. Saint Simeon then came to kiss her feet, and with joy reminded her of the day when he received the infant Jesus from her hands. Saint Zachary and Saint Elizabeth also came, and thanked her for that loving visit which, with great humility and charity, she had paid them in their dwelling, and by which they had received such treasures of grace. Saint John the Baptist came with still greater affection to thank her for having sanctified him by her voice. But how must her holy parents, Saint Joachim and Saint Anne, have spoken when they came to salute her? O God, with what tenderness must they have blessed her, saying: “Ah, beloved daughter, what a favor it was for us to have such a child! Be thou now our Queen; for thou art the Mother of our God, and as such we salute and adore thee”. But who can ever form an idea of the affection with which her dear spouse, Saint Joseph, came to salute her? Who can ever describe the joy which the holy patriarch felt at seeing his spouse so triumphantly enter Heaven and made Queen of Paradise? With what tenderness must he have addressed her: “Ah, my Lady and Spouse, how can I ever thank our God as I ought, for having made me thy spouse, thou who art His true Mother! Through thee I merited to assist on Earth the childhood of the Eternal Word, to carry Him so often in my arms, and to receive so many special graces. Ever blessed be those moments which I spent in life in serving Jesus and thee, my holy Spouse. Behold our Jesus! let us rejoice that now He no longer lies on straw in a manger, as we saw Him at His birth in Bethlehem. He no longer lives poor and despised in a shop, as He once lived with us in Nazareth; He is no longer nail to an infamous gibbet, as when He died in Jerusalem for the salvation of the world; but He is seated at the right hand of His Father, as King and Lord of Heaven and Earth. And now, O my Queen, we shall never more be separated from His feet; we shall there bless Him and love Him for all eternity”. All the angels then came to salute her; and she, the great Queen, thanked all for the assistance they had given her on Earth, and more especially she thanked the archangel Gabriel, who was the happy ambassador, the bearer of all her glories, when he came to announce to her that she was the chosen Mother of God. The humble and holy Virgin, then kneeling, adored the Divine Majesty, and all absorbed in the consciousness of her own nothingness, thanked Him for all the graces bestowed upon her by His pure goodness, and especially for having made her the Mother of the Eternal Word. And then, let him who can, comprehend with what love the Most Holy Trinity blessed her. Let him comprehend the welcome given to His Daughter by the Eternal Father, to His Mother by the Son, to His Spouse by the Holy Ghost. The Father crowned her by imparting His power to her; the Son, His wisdom; the Holy Ghost, His love. And the three Divine Persons, placing her throne at the right of that of Jesus, declared her Sovereign of Heaven and Earth; and commanded the Angels and all creatures to acknowledge her as their Queen, and as such to serve and obey her. Let us now consider how exalted was the throne to which Mary was raised in Heaven! How exalted was the Throne to which she was elevated in Heaven. “If the mind of man”, says Saint Bernard, “can never comprehend the immense glory prepared in Heaven by God for those who on Earth have loved Him, as the Apostle tells us, who can ever comprehend the glory He has prepared for His beloved Mother, who, more than all men, loved Him on Earth; nay, even from the very first moment of her creation, loved Him more than all men and Angels united”? Rightly then, does the Church sing, that Mary having loved God more than all the Angels, “the Mother of God has been exalted above them all in the heavenly kingdom”. Yes, “she was exalted “, says the Abbot Guarric, “above the angels, so that she sees none above her but her Son”, Who is the only only-begotten of the Father. Hence it is that the learned Gerson asserts that, as all the orders of Angels and Saints are divided into three hierarchies (according to the Angelic Doctor and Saint Denis), so does Mary of herself constitute a hierarchy apart, the sublimest of all, and next to that of God. And as, adds Saint Antoninus, the mistress is, without comparison, above her servants, so is “Mary, who is the sovereign Lady of the Angels, exalted incomparably above the angelic hierarchies”. To understand this, we need only know what David said: “The Queen stood on Thy right hand” – Psalm 44:10. And in a sermon by an ancient author, among the works of Saint Athanasius, these words are explained as meaning that “Mary is placed at the right hand of God”. It is certain, as Saint Ildephonsus says, that Mary’s good works incomparably surpassed in merit those of all the saints, and therefore her reward must have surpassed theirs in the same proportion; for, “as that which she bore was incomprehensible, so is the reward which she merited and received incomprehensibly greater than that of all the saints”. And since it is certain that God rewards according to merit, as the Apostle writes, “Who will render to every man according to his works” – Romans 2:6, it is also certain, as Saint Thomas teaches, that the Blessed Virgin, “who was equal to and even superior in merit to all men and angels, was exalted above all the celestial orders”. “In fine”, adds Saint Bernard, “let us measure the singular grace that she acquired on Earth, and then we may measure the singular glory which she obtained in Heaven”; for “according to the measure of her grace on Earth is the measure of her glory in the kingdom of the blessed”. A learned author remarks that the glory of Mary, which is a full, a complete glory, differs in that from the glory of other saints in Heaven. It is true that in Heaven all the blessed enjoy perfect peace and full contentment; yet it will always be true that no one of them enjoys as great a glory as he could have merited had he loved and served God with greater fidelity. Hence, though the saints in Heaven desire nothing more than they possess, yet in fact there is something that they could desire. It is also true that the sins which they have committed, and the time which they have lost, do not bring suffering; still it cannot be denied that a greater amount of good done in life, innocence preserved, and time well employed, give the greatest happiness. Mary desires nothing in Heaven, and has nothing to desire. Who amongst the saints in Heaven, except Mary, says Saint Augustine, if asked if he has committed sins, could say no? It is certain, as the holy Council of Trent has defined, that Mary never committed any sin or the slightest imperfection. Not only she never lost Divine grace, and never even obscured it, but she never kept it idle; she never performed an action which was not meritorious; she never pronounced a word, never had a thought, never drew a breath, that was not directed to the greater glory of God. In fine’, she never cooled in her ardor or stopped a single moment in her onward course towards God; she never lost anything by negligence, but always corresponded with grace with her whole strength, and loved God as much as she could love Him. “O Lord”, she now says to Him in Heaven, “If I loved Thee not as much as Thou didst deserve, at least I loved Thee as much as I could”. In each of the saints there were different graces, as Saint Paul says, “there are diversities of operations (graces), but the same God, Who worketh all in all” – 1Corinthians 12:6. So that each of them, by corresponding with the grace he had received, excelled in some particular virtue – the one in saving souls, the other in leading a penitential life; one in enduring torments, another in a life of prayer; and this is the reason for which the holy Church, in celebrating their festivals, says of each, “there was not found one like him”. And as in their merits they differ, so do they differ in celestial glory: “One is the glory of the sun, another the glory of the moon, and another the glory of the stars. For star differeth from star in glory” – 1Corinthians 15:41. Apostles differ from martyrs, confessors from virgins, the innocent from penitents. The Blessed Virgin, being full of all graces, excelled each saint in every particular virtue; she was the Apostle of the apostles; she was the Queen of martyrs, for she suffered more than all of them; she was the standard-bearer of virgins, the model of married people; she united in herself perfect innocence and perfect mortification; in fine’, she united in her heart all the most heroic virtues that any saint ever practiced. Hence of her it was said that “The Queen stood on thy right hand, in gilded clothing; surrounded with variety” – Psalm 44:10. For all the graces, privileges, and merits of the other saints were all united in Mary, as the Abbot of Celles says, “The prerogatives of all the saints, O Virgin, thou hast united in thyself”. She possessed them in such a degree that, as “the splendor of the sun exceeds that of all the stars united”, so, says Saint Basil of Seleucia, “does Mary’s glory exceed that of all the blessed”. Saint Peter Damian adds, that “as the light of the moon and stars is so entirely eclipsed on the appearance of the sun, that it is as if it was not, so also does Mary’s glory so far exceed the splendor of all men and angels, that, so to say, they do not appear in Heaven”. Hence Saint Bernardine of Sienna asserts, with Saint Bernard, that the blessed participate in part in the Divine glory; but that the Blessed Virgin has been, in a certain way, so greatly enriched with it, that it would seem that no creature could be more closely united with God than Mary is: “She has penetrated into the bottom of the deep, and seems immersed as deeply as it is possible for a creature in that inaccessible light”. Blessed Albert the Great confirms this, saying that our Queen “contemplates the majesty of God in incomparably closer proximity than all other creatures”. The above named Saint Bernardine moreover says, “that as the other planets are illumined by the sun, so do all the blessed receive light and an increase of happiness from the sight of Mary”. And in another place he also asserts that “when the glorious Virgin Mother of God ascended to Heaven, she augmented the joy of all its inhabitants”. For the same reason Saint Peter Damien says, that “the greatest glory of the blessed in Heaven is, after seeing God, the presence of this most beautiful Queen”. And Saint Bonaventure, that, “after God, our greatest glory and our greatest joy is Mary”. Let us then, rejoice with Mary that God has exalted her to so high a throne in Heaven. Let us also rejoice on our own account; for though our Mother is no longer present with us on Earth, having ascended in glory to Heaven, yet in affection she is always with us. Nay, even being there nearer to God, she better knows our miseries; and her pity for us is greater, while she is better able to help us. “Is it possible, O Blessed Virgin”, says Saint Peter Damien , “because thou art so greatly exalted, thou hast forgotten us in our miseries? Ah no, God forbid that we should have such a thought! So compassionate a heart cannot but pity our so great miseries”. “If Mary’s compassion for the miserable”, says Saint Bonaventure, “was great when she lived upon Earth, it is far greater now that she reigns in Heaven”. Let us, in the mean time, dedicate ourselves to the service of this Queen, to honor and love her as much as we can; for as Richard of Saint Lawrence remarks, “she is not like other rulers, who oppress their vassals with burdens and taxes; but she enriches her servants with graces, merits, and rewards”. Let us also entreat her in the words of the Abbot Guarrie: “O Mother of mercy, thou who sittest on so lofty a throne and in such close proximity to God, satiate thyself with the glory of thy Jesus, and send us, thy servants, the fragments that are left”. Thou dost now enjoy the heavenly banquet of the Lord; and we, who are still on Earth, as dogs under the table, ask thy mercy. Father Silvano Razzi relates that a devout ecclesiastic and tender lover of our Queen Mary, having heard her beauty greatly extolled, had a most ardent desire once to see his Lady; and therefore, with humble prayers, begged this favor. The clement Mother sent him word by an angel that she would gratify him, by allowing him to see her; but on this condition, that after seeing her he should remain blind. He accepted the condition. Behold, one day the Blessed Virgin appeared to him; but that he might not remain quite blind, he first wished to look at her with one eye only; but afterwards, overcome by the great beauty of Mary, he wished to contemplate her with both; whereupon the Mother of God disappeared. Grieved at having lost the presence of his Queen, he could not cease weeping, not indeed for his lost eye, but because he had not seen her with both. He then began to entreat her again that she would once more appear to him, being quite willing, for this purpose, to lose the other eye and become blind. “Happy and contented shall I be, O my Lady”, he said, “to become wholly blind for so good a cause, which will leave me more than ever enamored of thee and of thy beauty”. Mary was graciously pleased once more to satisfy him, and again consoled him with her presence; but because this loving Queen can never injure any one, she not only did not deprive him of the sight of the other eye, but even restored him the one he had lost. O great, exalted, and most glorious Lady, prostrate at the foot of thy throne we adore thee from this valley of tears. We rejoice at thy immense glory, with which our Lord has enriched thee; and now that thou art enthroned as Queen of Heaven and Earth, ah forget us not, thy poor servants. Disdain not, from the high throne on which thou reignest, to cast thine eyes of mercy on us miserable creatures. The nearer thou art to the source of graces, in the greater abundance canst thou procure those graces for us. In Heaven thou seest more plainly our miseries; hence thou must compassionate and succor us the more. Make us thy faithful servants on Earth, that thus we may one day bless thee in Heaven. On this day, on which thou wast made Queen of the Universe, we also consecrate ourselves to thy service. In the midst of thy so great joy, console us also by accepting us as thy servants. Thou art, then, our Mother. Ah, most sweet Mother, most amiable Mother, thine altars are surrounded by many people; some ask to be cured of a disorder, some to be relieved in their necessities, some for an abundant harvest, and some for success in litigation. We ask thee for graces more pleasing to thy heart; obtain for us that we may be humble, detached from the world, resigned to the Divine Will; obtain us the holy fear of God, a good death, and Paradise. O Lady, change us from sinners into saints; work this miracle, which will redound more to thy honor than if thou didst sight to a thousand blind persons, or didst raise a thousand from the dead. Thou art so powerful with God, we need only say that thou art His Mother, His beloved one, His most dear one, filled with His grace. What can He ever deny thee? O most beautiful Queen, we have no pretensions to see thee on Earth, but we do desire to see thee in Paradise; and it is thou who must obtain us this grace. For it we hope with confidence. Amen.